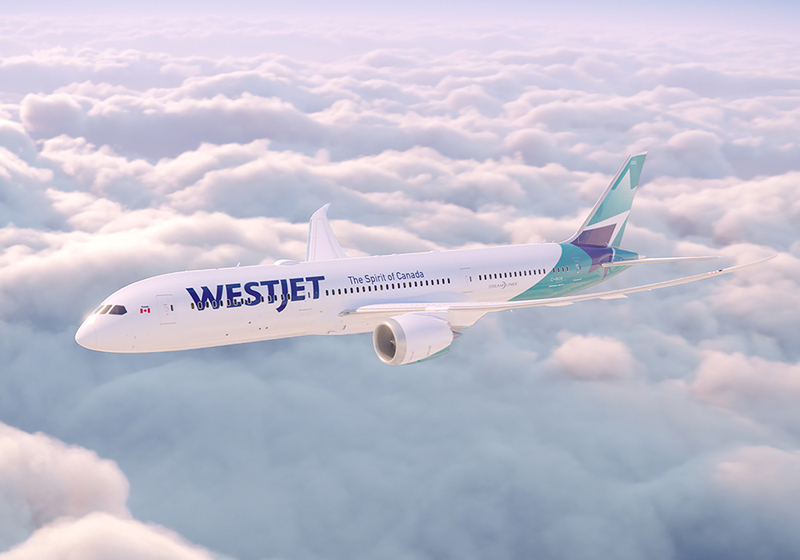 When I saw the CGI renders of WestJet’s new Boeing 787, it’s fair to say that my jaw dropped. A fully flat bed with direct aisle access for every passenger in an outward-facing herringbone. 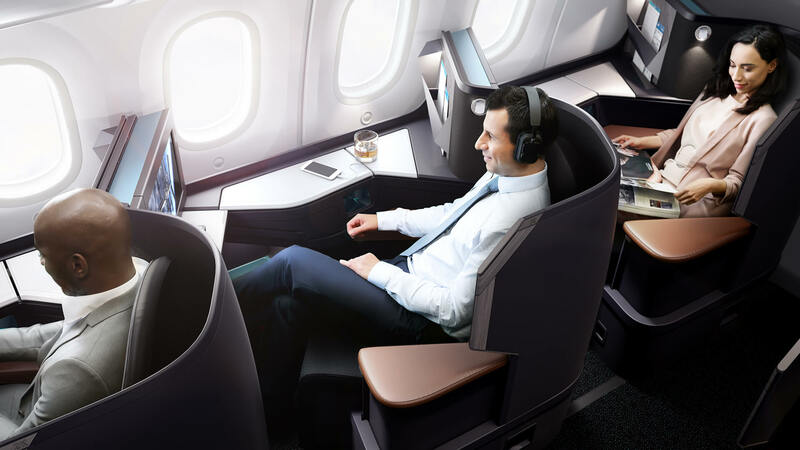 A full premium economy cabin. 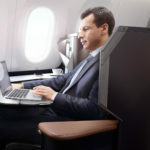 Connectivity, entertainment — and a feeling both that the bar has been raised for longhaul, low-cost carriers, if not the entire industry. 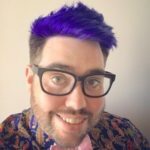 Let’s start, as we usually do in this column, up front. 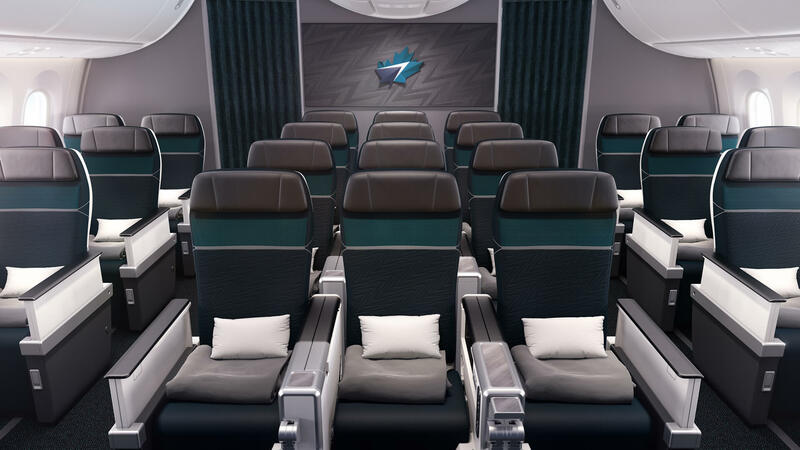 WestJet’s business class looks to me from the structure and design language to be the Rockwell Collins Super Diamond seat, rather than the next-generation version of the platform, Elements. 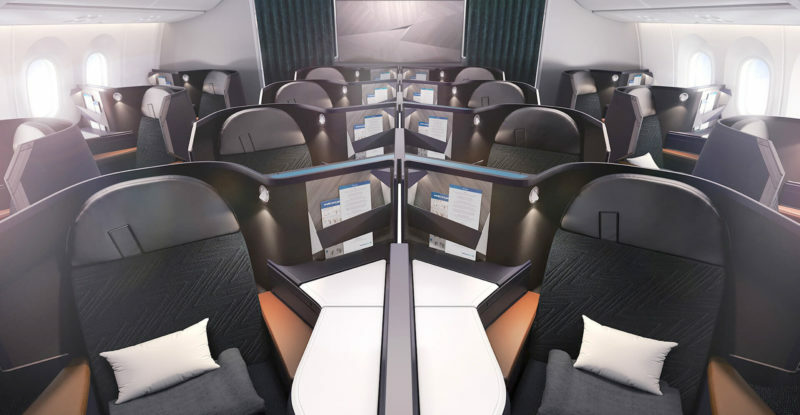 The airline has worked with design house PriestmanGoode on the product, which is a resounding success. The “luxuriously rich earth tones” lend a sophisticated air to the cabin, avoiding the “greige” while cleverly managing to highlight functionality using colours: the slide-out table is a marble effect; the side consoles a pearlescent white; the armrests a warm tan leather. 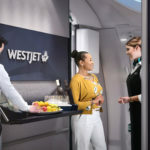 Eighteen-inch Panasonic Avionics inflight entertainment monitors raise the bar too, as WestJet makes the most of its last-mover advantage in the Canadian market. 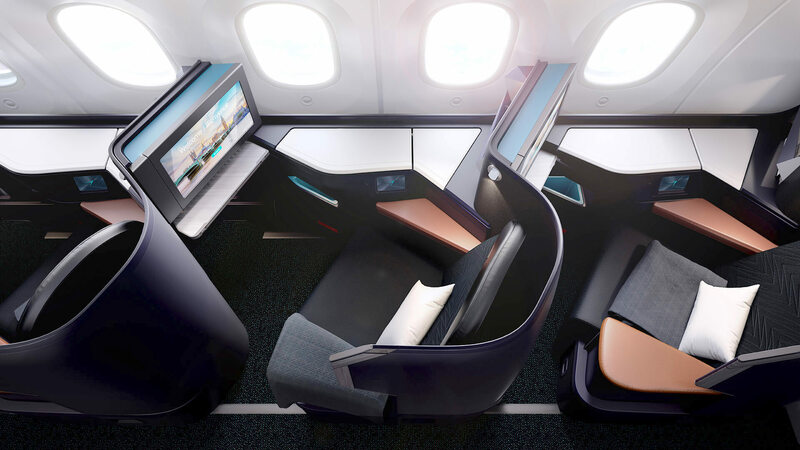 But I’m most impressed by the fact that this is no off-the-shelf “what colour do you want your thermoplastic shell” cabin, and one that ties in with a wider airline brand change. WestJet has taken the opportunity of the arrival of its “Spirit of Canada” (and “L’esprit du Canada”, bien sûr! 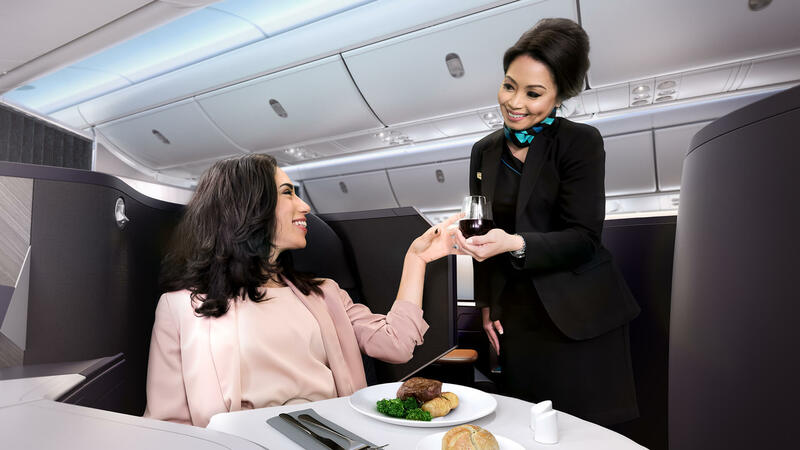 )-monickered Dreamliner to update its branding with Ove Brand Design, and now sports a less excitable, more mature wordmark, more of its brand-distinguishing “glacier turquoise”, and an updated angular maple leaf motif on the vertical stabiliser. It’s a pleasing update, and I’m very impressed by how the airline has worked in an internal take on the angular brand language on the tail. The herringbones in business make the most of these angles, with the angles of the standard product picked out in contrast, the privacy wings cut on a bias with wood-effect thermoplastic insets, and an all-the-angles literature pocket that looks as if it will also function as storage space. 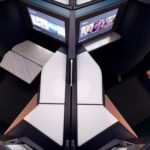 Further back in the 787, a fold-down self-service space sits at what one must assume is doors 2 together with several three-dimensional logos and brand assets, which are not only bang on airline trend but also provide an opportunity for the brand to be part of passengers’ selfie moments. 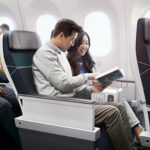 In premium economy, WestJet looks to have selected the Rockwell Collins MiQ product, unless some other seatmaker has poached its patented vertical sliding armrest. This product fills the “comfort canyon” between herringbone business and the narrow 3-3-3 Dreamliner economy product down back. 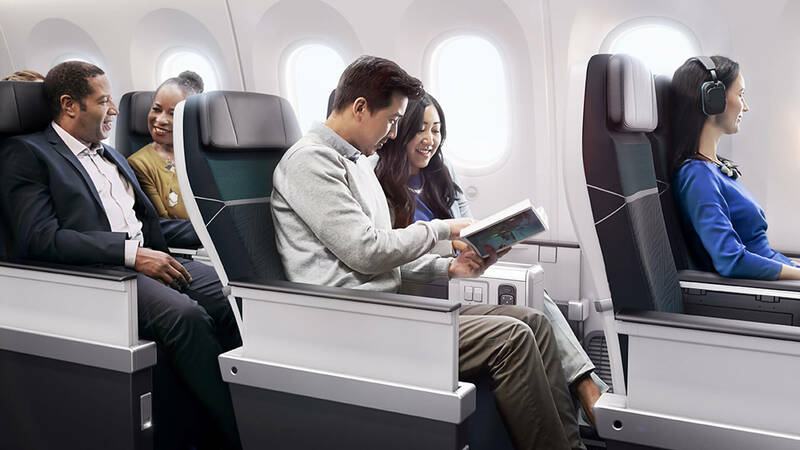 Even in economy, WestJet looks to have made a smart selection, with what looks like a Recaro fully featured new-generation longhaul slimline, the CL3710 if I’m not mistaken. That’s about as good as you’re going to get on a non-JAL 787. 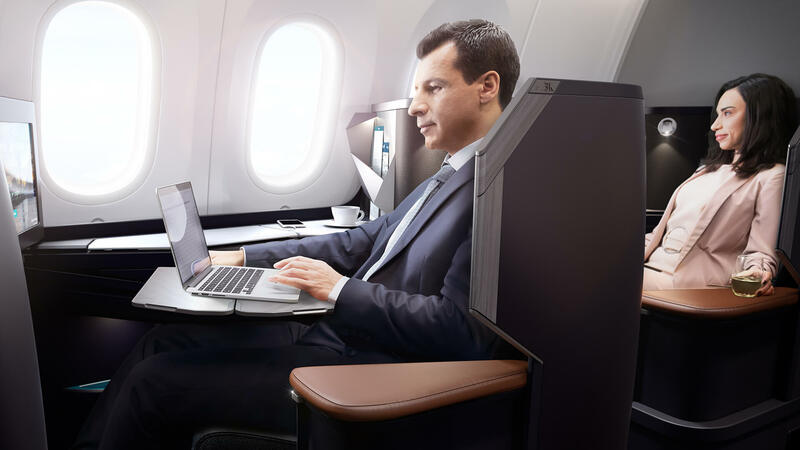 And the carrier is offering Panasonic Ku-band satellite-supported connectivity to passengers. 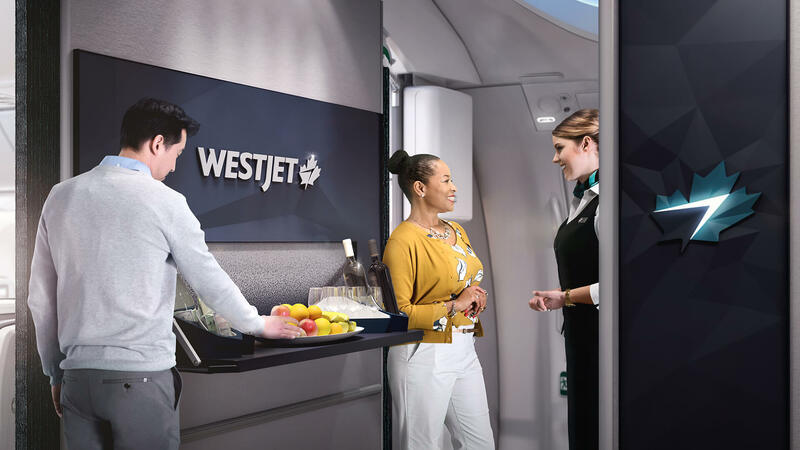 The Dreamliner is a gamechanger for WestJet, not just in its international push but in market positioning. It’s remarkable how much more grownup and premium the airline feels with the addition of this aircraft. I’m very impressed. is it me or is Westjet one of those companies with a reality distortion field about them? 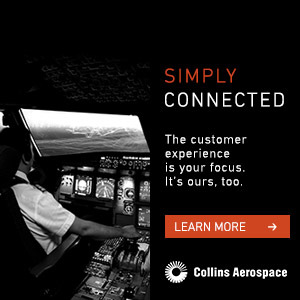 They claim to be low cost yet they are compatible to the competition. 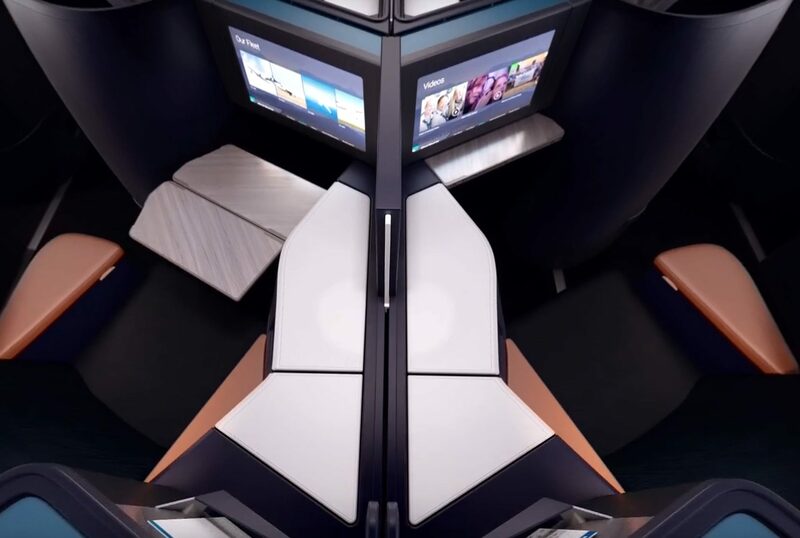 They release some renderings of a 787 cabin that literally looks like they took the Air Canada brochure and photoshopped some wood grain and darker colors and people go crazy on how wonderful it is. Now I will say the outside of the plane is pretty but the absence of anything red makes me question how Canadian it is. 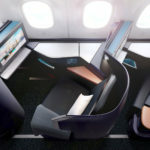 I think the plane and the 787 renderings look really nice and I congratulate them. But truth be told I see very little innovation in the product they are offering.